Posts tagged "Polk County Historical Museum"
Published: Friday, October 31, 2003 at 4:27 a.m.
Last Modified: Friday, October 31, 2003 at 7:59 a.m.
BARTOW — Not too long after she began working at the Polk County Historical Museum, Robin Golden started receiving reports that she had left lights burning in the building overnight. Knowing she had turned out the lights before she left each day, Golden could think of only one explanation for custodians finding the rooms brightly lit — the resident ghosts were playing games with her. The lights have remained off all night ever since. These types of experiences were happening in the museum and historical library long before Golden was hired as the museum assistant — incidents that tend to gain prominence around Halloween. Built during late 1908 and 1909, the domed brick-and-limestone building at Main Street and Broadway Avenue once housed the Polk County Courthouse. But during his 20-plus years with the historical library, Spann has always felt safe. “I’ve been here for hours and hours, and I’ve never felt threatened,” Spann said. That’s not to say he hasn’t experienced some strange situations. Approximately 10 years ago, Spann was working alone in his office a couple of hours after the library and museum closed. But no one was. At least no one living. According to Tampa-based clairvoyant the Rev. Janet Reynolds, who recently visited the old courthouse, Spann could have heard any of 12 different spirits that are in residence. In a building that has been the scene for a lynching, a fatal explosion in the boiler room, viewing area of the body of a slain marshal, and nearly a century of death sentences, there are plenty of stories that conjure the idea of ghosts. In 1955, Judge Curtis Chillingworth and his wife, Mary, disappeared from their beach house in South Florida. Though their bodies were never found, eventually it was discovered that Judge Joseph Peel Jr. had the couple killed. The Chillingworths were taken out in the Atlantic Ocean, locked in chains, tied to weights and thrown overboard. Peel’s murder trial was moved to Bartow because of the notoriety of the case in South Florida. Library and museum employees wonder if the Chillingworths’ spirits are responsible for a couple of unexplained happenings. “Patrons have heard footsteps behind them and we think it has been Judge Chillingworth,” Golden said. Patrons, people setting up museum displays, and custodians have also heard these footsteps. And the judge may be responsible for the malfunction of locks in the building. “We think the problem we have with locks has to do with the judge,” Spann said. “Some of them don’t operate or operate backwards. “We keep his picture on the wall upstairs. We want him to know that we recognize he is here,” Spann said. Golden said other suspicious incidents inside the old courthouse building include the presence of “The Lady in White,” who appears as a human; elevators running without reason; screaming coming from the boiler room; visitors feeling something touching their hair and neck; and cold spots in various rooms. The areas where Reynolds felt the most foreboding presence were the rotunda, video room and the boiler room. The rotunda was where the slain marshal laid in state, Golden said. Reynolds also felt some good vibes. Like Spann and Golden, Reynolds isn’t afraid to be in the building, even in those areas where she has had negative reactions. “I didn’t feel any fear. I only felt what happened,” she said. 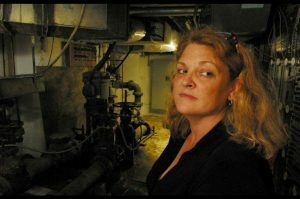 Golden takes the seemingly paranormal activity in stride and attributes it to the historic atmosphere in the building.